With the critical success of the return of Donkey Kong in Donkey Kong Country Returns on Wii in 2010, I was expecting a sequel and Nintendo gives it to us in Donkey Kong Country: Tropical Freeze on Wii U. While the Wii game jumped to 3DS in a 3D remake last year, the all-new game just came out very recently, and I feel it’s worthy of the Donkey Kong Country name. I will start off by saying I was very impressed when I saw the intro. You can really see the detail Nintendo and Retro Studios put into Tropical Freeze. Donkey Kong and his friends have never looked better. I usually don’t talk about graphics much, but the graphics, as well as the music, help bring the game to life. When you start the game you are treated to the intro I was talking about. The Kongs are having fun on their island until these Vikings come to stir up trouble, and now you need to save your island from freezing over. Not much of a story, but Donkey Kong games have never been about the story. Dixie Kong and Diddy Kong are back, but the most notable addition is Cranky Kong. After mostly complaining over the years, the elderly hipster of the Kong family is finally playable. His unique move is using his cane to bounce on enemies and the ground, exactly like the classic NES game Ducktales. I never used Cranky Kong too much, as I found Dixie’s ponytail copter to be of more use. There are a few levels where Cranky Kong is very useful as you can bounce off of spiked platforms without getting hurt, but for 90% of the game I found Dixie and Diddy more helpful. Every Kong has a special move that whenever you defeat enough enemies, press L or R and use your Kong power. Each Kong power turns enemies on the screen into an item. For Diddy it’s extra life balloons, Dixie it’s extra health, and for Cranky it’s banana coins you can use at Funky Kong’s shop. Speaking of Funky Kong’s shop, you can buy many different things from said shop. Extra lives, items such as a parrot that locates puzzle pieces, extra health, temporary invincibility, and more. You can also purchase a collectable figurine, however it’s from a slot machine so you will get multiple copies of the same figurine. Every level is fun, I can’t think of any levels I particularly hated. Even the infamous minecart levels are more fun than frustrating. That’s what I loved about Tropical Freeze, no matter how frustrating the game gets, it’s still fun, something that many games today have trouble doing. Like I mentioned, the minecart levels are back, and so are the rocket barrel ones, but most of the levels are your 2D platformer stages. Some levels have an alternate exit, where you’ll go a different route on the world map. Every level is creative, you will be surprised how often you think there are no more unique levels, and then you run into another creative obstacle that keeps the game fresh. The bosses were varied, I thought a few were a little meh, but even the bad ones were fun. Every Donkey Kong Country game has had a great musical score, and Tropical Freeze delivers once again. If you’ve played Any Donkey Kong Country game, you know what to expect. Calming music, fast-paced music, epic music, it has it all. I’ve done nothing but praise Tropical Freeze, but there is something all Donkey Kong Country veterans should know, these games are downright frustrating. You will die, a lot. I don’t know if I tried to rush through levels and I lost lives because of that, or that the game really is that hard, I don’t know. I probably lost over a hundred lives in the entire game, but I never got a game over. Lives are not hard to get if you collect plenty of bananas and look for secret areas, which are full of bananas. Like I’ve said, the game is still fun even when you’re losing a lot of lives, but maybe that was just me. You might think differently. You might get frustrated and hate the game, but with every death you learn what not to do, and you learn from it. Hard games are like that crossword puzzle you’ve been trying to solve for a week; you might get very frustrated, but you’ll feel satisfied when you figure it out, and Tropical Freeze is no different. The funny part is I don’t think this was hard for a Donkey Kong Country game; it was less difficult than some of the others, but still challenging. Will hearing that Tropical Freeze can be hard keep you buying it? It shouldn’t. Maybe I’m saying it’s hard compared to other games of today. It wouldn’t be called difficult in the 8-bit or 16-bit days at all. Just don’t try to play it in co-op. I never played co-op, because it would be a nightmare. It would be hard staying on the same page in most of the levels, especially the fast-paced levels where the inexperienced gamer will be losing lives every five seconds. 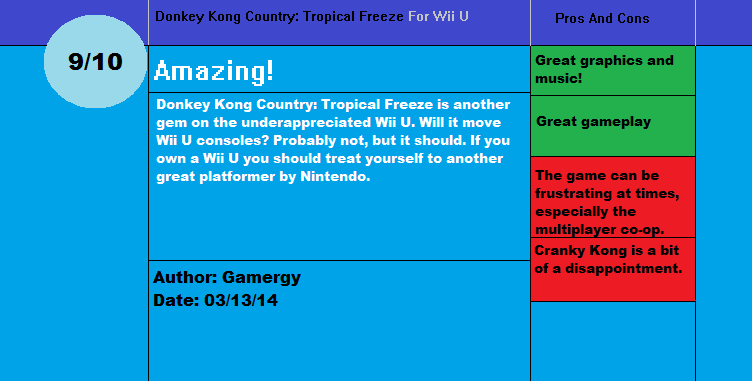 With all that said, Donkey Kong Country: Tropical Freeze is another gem on the underappreciated Wii U. Will it move Wii U consoles? Probably not, but it should. If you own a Wii U treat yourself to another great platformer by Nintendo. Main Cons: Frustrating, co-op is probably a bad idea, Cranky Kong is a bit of a disappointment. I need to purchase Tropical Freeze sometime. Anyways your review is as impressive as ever. Very nice review, Gamergy. I have come across a few reviews sanctioning scores from the game because it was either too difficult, or does not live up to classic Donkey Kong games. I am really tired of seeing critics comparing the new with the old, and their choice of words become nothing less than repetitive. Although you too acknowledged the difficulty in DKC: Tropical Freeze, I'm glad you took this as a positive rather than a negative. Kudos to you! @biorn the viking I think the "living up to the classic Donkey Kong games" are reviewers speaking from nostalgia. Tropical Freeze could be 1000x better than the SNES games and they would say the same thing. When you play the first game in a great series, especially as a kid, you tend to think it's the best one in the series no matter how good the others are. As a reviewer your job is to review the game without your nostalgic memories getting in the way. Very few readers are going to feel the same nostalgia, so you need to separate your personal experiences with previous games and focus on the game you're supposed to be reviewing. And yeah, I like when a game is difficult (to a certain degree). Trauma Center: New Blood is one of my favorite Wii games and it's one of the hardest games I've played. Difficult doesn't mean bad! Donkey Kong Country not popular here, but I like game! Such nice review Mr. Gamergy. @Gamergy In your opinion which game is better? Donkey Kong Country: Returns or Donkey Kong Country: Tropical Freeze? Gamergy your reviews are awesome! @Marioman18 I'm Embarrassed that I never got very far in Returns, but what I remember is the controls in Returns were annoying. Personally I like motion control, but I would always mess up with the motions; I tried to stop and blow the flowers or pound the ground but I would usually end up doing a roll somehow. I also remember Returns being very hard, at least at a point where I gave up on the 2nd or 3rd world because I couldn't beat the boss. Looking back now I realize that was stupid to give up; I probably died at the same rate as Tropical Freeze, but it was more being frustrated with the controls than "this game is hard I give up" plus I was playing more of other games at the time too. I will say from the first world in Returns' perspective, Tropical Freeze was better. However I feel Returns would get better in later worlds, as did Tropical Freeze. I should play Returns again, maybe then I'll have a real answer. 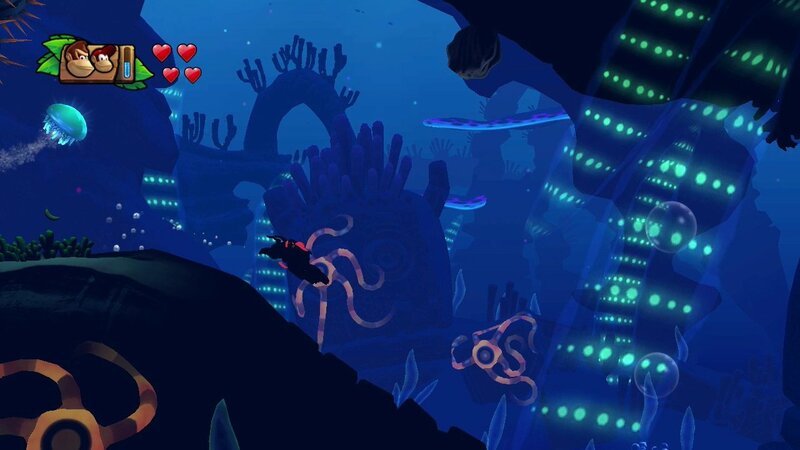 I'm glad that Retro brought back underwater levels and wintry levels in this game! To those who doubted...you just got burned! She hits 'em hard...with her golden locks! Which makes her foes...just wanna cry! Cranky's here...to show all o' you! How to bash...those nasty guys! And how to win...every single prize! Underestimate him, or he won't play fair! Hey! Are you underestimating me? Is that part of the DK Clap-trap supposed to be sarcasm?! The detail of your reviews is astounding. Nice work!